It has been a while since I stretched my lettering skills. After doing some watercolor studies which I posted earlier, I thought doing a canvas painting would be a nice touch to the American flag series already produced. This original painting measures 2'x3' on canvas. The colors are meant to blend with the other paintings in the American Flag series but I think it stands on its own merit as a single display piece. The calligraphy flowing in a free form like this gives life to the words of the Preamble to the Constitution. By putting them in free flowing rows they begin to represent the stripes of a flag catching a nice breeze. I wanted to make the words of the Preamble beautiful to look at as individual strokes as well as impact-full and alive when viewed as a whole image with the original typeface featured on the original Preamble "We The People". Smaller signed Giclee prints of this painting 12"x12" will be offered for $200.00 each if ordered through Berger Fine Arts. Email (steve@bergerfiinearts.com) if interested in purchasing. After seeing the Irish Brigade flag I was approached to do a German flag for an office enviroment. Take a look at the lettering. Not only is this font style fun and unique but it just looks splendid when combined with the other elements in this image. I wanted to combine the German flag colors with a traditional German Icon of the eagle to convey the old with the new Germany in one image. This 2'x2' image is meant to make a bold statement in any room. Smaller signed 12x12 Giclee prints of this painting will be available for around $200.00. Framing will be available. 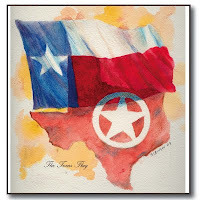 I have been producing state flags and I was doing a watercolor study for a larger acrylic painting of the state of Texas flag. I was trying something a little different by adding some other elements to the art rather than just the flag. I am still not sure about doing it for every state but it does add a little something to the painting. I still like making watercolors too so if anyone is interested in purchasing this art contact me at steve@bergerfinearts.com. It was time to stretch my calligraphic skills again and I wanted to do something with the preamble to the U.S. Constitution which I have included in my Historic U.S. Flag series. My goal was to use type as part of the design to represent a waving flag and keep it interesting enough with the combination of type styles to be fun and beautiful to look at. This is another watercolor which measures 11x17. I plan on making this into a 4'x4' acrylic painting to accompany the rest of the US Flag series. If you are interested in this painting email me at steve@inposition.biz and I will gladly make you a Giclee or watercolor print. I recently went home to my high school reunion and enjoyed the company of a lot people who I have not seen in a long time. People and places all change and we laughed and talked about the changes in our lives since we were last together. It made the evening a lot of fun. I did notice that every five years or so when I come back for a reunion that buildings that I thought would be there long after I was gone are disappearing. First it was St. Mary's grade school, then they the St. Mary's High School was demolished and finally this year it was St. Mary's Church. The church I believe was built in the early part of the century. With it being gone there is nothing left to even recognize that St.Mary's school or parish ever existed. Its all in our memories now and they too will fade. At any rate I thought I would make a painting to at least keep some of the memories fresh and to remind others who never knew about St. Mary's that the school existed and the events that happened there shaped a lot of kids for a lot of years. Enough said. I recently joined the home of Aviation Art Hangar's Gallery of world renowned aviation artists. You will find my work under the new category of "Other Military and Patriotic Art" I am very excited to be a part of this gallery's selections. Aviation Art Hangar is based out of Columbia Maryland and the owner is an aviation enthusiast and a pilot for life. The owner hand selects artists and artwork with customer satisfaction paramount in all the gallery's selection offerings. This is a first class operation and I am very proud to have my work displayed with world renown aviation artists like Robert Taylor, Stan Stokes, John Shaw, Robert Baily, Phillip West, William Phillips and dozen of others. Go to Art Hangar at www.aviationarthangar.com and you will see quite a collection of the finest aviation art found anywhere. You will also see some flags their too. There has been a tremendous amount of interest in this image since I originally posted it and I finally wanted to get it posted and priced. This limited edition Giclee print (100 prints) is is ready to frame. The powerful image is a unique piece of Marine Corp art. Email orders at steve@bergerfinearts.com with your contact information including email address and phone number where you can be reached. Wow, I did not know what I was going to uncover when doing the research for this flag. This painting depicts the Alamo flag. Or is it? For well over 150 years, popular culture has placed the 1824 Flag flying from the walls of the Alamo during those fateful thirteen days when a handful of determined men stood before the might of the Mexican army and shouted "Liberty or Death." The idea that the defenders of the Alamo flew the 1824 Flag is rooted solely in the belief that the defenders were fighting for the restoration of the Mexican Constitution of 1824. That belief and all conjecture that flows from it, are unfounded. Indeed, the idea that the defenders would have considered flying the 1824 Flag from the walls of their fortress is, at the very least, far fetched and, at the most, demeaning to their cause and their memory. This flag existed no doubt but there is no empirical evidence to prove that the green, white and red tricolor with the black numerals 1824 supplanting the central Mexican eagle was ever used at the Alamo. The flag was not captured and preserved by the victors nor recorded in the military accounts of the day. Though there were accounts by Texans of it being captured from the Mexican army months after the fall of the Alamo at a later battle. The few people who survived the battle were never asked about the flags the Texans flew. Those citizens of Béxar who were asked about the subject were questioned some seventy years after the fact and gave answers that are open to very broad interpretations. That leaves only the desire to restore the Mexican Constitution of 1824 to bear the full weight of evidence for the idea that the Alamo defenders would fly the 1824 Flag. So what to believe is up to you and the historical record. Labels: Is It The Real Alamo Flag? Terry James Art Gallery in Oxford Connetticut announced that they are showing my work in their gallery and on their website. Owned and operated by James and Terry Tottenham since 1987. Their Featured Artists include Don Troiani and Terry Waldron. If you love history you will absolutely love the art at this site. The Gallery is a showcase for historical art. It is a real honor to be included with this wonderful gallery and this group of talented artists. Visit their website address at http://www.terryjamesart.com and you will see what I mean. For now my work is listed under featured artists section at their home page. I can not say it loud enough. Thank you Jim and Terry for including my work in your gallery. I hope all my friends visit you and keep coming back to www.bergerfinearts.com and visit the blog section listed on my home page to see my current work. Here is a new regimental flag that I recently completed. All my Irish friends will say this one has been overdue. This is the infamous 4th Irish Brigade flag.N JULY 21st, 1861, at the battle of Bull Run Captain Thomas Francis Meagher of the 69th New York State Militia had his horse shot from under him by a round of cannon-fire. Meagher, that day acting as major for the regiment, sprang to his feet and shouted, "Boys! look at that flag--remember Ireland and Fontenoy." The Federal army was badly beaten and routed but the Irish Sixty-ninth, an old pre-war militia regiment, had charged bravely and stubbornly held its ground. Even after its commander, Colonel Michael Corcoran, was wounded and captured, the Sixty-ninth as part of the rear guard retreated in good order while panicked Union soldiers swarmed around them. Union commander General Irvin McDowell personally thanked them for their gallantry. The Irish Brigade was an infantry brigade, consisting predominantly of Irish immigrants, that served in the Union Army in the American Civil War. The designation of the first regiment in the brigade, the 69th New York Infantry, or the "Fighting 69th", continued in later wars. They were known in part for their famous warcry, the "faugh a ballagh", which is an old Gaelic phrase, fág an bealach, meaning "clear the way". Captain Meagher evoked the name of Fontenoy that day to inspire his men, a name of deep significance to every Irish soldier. At that place, in 1745, French General Maurice de Saxe triumphed over the British, a victory owed to an unstoppable bayonet charge by the French army's brigade of Irish exiles. Throughout its long history this brigade performed many such feats of courage, and though its beginnings date back to a time of more than one hundred-seventy years before Bull Run, its deeds were fresh in the minds of the men of the 69th New York. This is a flag that is rich in history. It is also so very unique. This flag was painted after visiting Historic Fort Snelling. The flag setting is fantastic because it is on the Fort Snelling grounds and the fort has been painstakingly rebuilt to reflect the 1840's period of its existence. It is done very well and I hope to paint more scenes of the fort and its buildings. This flag is mounted on a ships mast. The reason being was the only way soldiers at the fort knew how to make a flagpole was to mimic what they knew how to build. Most at one time or another were on ships and the mast of ship was used to hoist a flag. So they built a mast and it is still there today being used. I am sure there is no ship buried under the mast but it did cross my mind when I first saw the pole at the site. This is another large 4'x4' painting. I departed from the muted colors of the other flags of this series for a change and am instead relying on the bright colors for visual impact. Smaller prints are available. Please contact me at steve@bergerfinearts.com if interested in purchasing. I recently attended an air show with my youngest son where we had the honor to meet two surviving pilots of the Doolittle air raid on Tokyo. I will post that encounters details, pictures and conversations when I finish the sketch I am doing of the plane that helped these pilots become legends. Really was neat to meet them, both of which are in their 90's. At this show my son and I encountered a working Boeing B-17 bomber from world war II. We climbed into it and toured the entire plane. I was able to take some pictures and from that was able to paint the attached art you see here. There are more paintings that I will do of this plane. It was a fun way to spend a summer Sunday with family and the best way to do research for painting accurate details. I still have not figured out how the tail gunner on this plane got in and out of his spot. If anyone out there knows about that please feel free to email me. This painting "B-17 In The Clouds" is now available. The original is a 4'x 4'. A Single Order Signed/Numbered Print with a 40”x 40” Image area is $620.00 A 16” x 16” Image Area. Final Print Size 18”x18” cost $350.00. Email me at steve@inposition.biz if interested in owning this print. Finally, I finished the "Green Mountain Boys"flag. 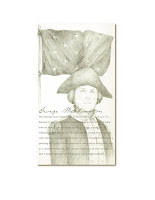 This flags history began with a very determined patriot named Ethan Allen. This post may be rather lengthy but I love the history behind this flag. After settling in Bennington Vermont, Allen became prominently involved in the struggle between New York and New Hampshire for control of the region. Following rejection by the New York authorities of an appeal that the region be established as a separate province, Allen organized a volunteer militia, called the Green Mountain Boys, to resist and evict proponents of the New York cause. He was thereupon declared an outlaw by the royal governor of New York. This was by all measures the beginning of an interesting collection of individuals. In painting this flag I noticed that there really is no pattern arangement for the stars on the flag. I am looking to see if they are part of a constellation or if there is a significance to the arrangement of the thirteen stars. At the outbreak of the American Revolution, Allen and his force offered their services against the British. On orders from the Connecticut legislature, Allen, and the Connecticut soldier Benedict Arnold, with a contingent of the Green Mountain Boys captured Fort Ticonderoga early in the morning of May 10, 1775. Allen demanded surrender from the British commander "in the name of the Great Jehovah and the Continental Congress." Subsequently, as a member of the army of General Philip John Schuyler, he rendered valuable service in the American military expedition against Canada. He was taken prisoner near Montréal in September 1775 and held in confinement until exchanged in 1778. Following his release by the British, he returned to his home and was commissioned a lieutenant colonel in the Continental Army and major general of militia.Noted in a previous post The Green Montain Boys helped helped win the Battle of Bennington in Vermont. The Green Montain Boys repeatedly harassed New Yorkers and, after the war, declared Vermont an independent republic. In 1778 Allen appeared before the Continental Congress in behalf of a claim by Vermont for recognition as an independent state. With his brother Ira Allen and other Vermonters he devoted most of his time thereafter to the territorial dispute. He negotiated with the governor of Canada between 1780 and 1783, ostensibly to establish Vermont as a British province. On the basis of this activity he was charged with treason, but, because the negotiations were demonstrably intended to force action on the Vermont case by the Continental Congress, the charge was never substantiated. He wrote a Narrative of Colonel Ethan Allen's Captivity (1779). Allen died in Burlington, Vermont, on February 12, 1789. When New York relinquished its claims to the land, Vermont applied for statehood and in 1791 became the 14th state. It would have been interesting to meet Ethan Allen and discuss his views of George Washington and the forming new Republic. I Finally have the Swallow Tail flag finished the way I wanted it to look. I was trying to keep it simple with one "non flag element" added and the finished piece shows it worked well. I had sketched a a rider on a horse holding this flag and then a total upper body of a rider and part of the horse but it just did not fit with the rest of series so it all got painted over. I had to keep this simple. The riders upper body looking beyond the flag adds just the right element of expectation and anticipation that this flag must have carried with it for all cavalry regiments during the Civil War and the Western campaigns that followed. I like this flag. On May 9th (a very cold May 9th) I attended a military family picnic in Farmington Minnesota where soon to be deployed Minnesota soldiers had a great time with their families and friends playing games, catching up with friends and eating some great food. No Lutefisk was served but I don't think anyone noticed. 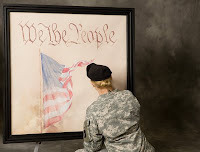 The picture here shows a soldier signing her name to the flag print "We the People". Soldiers were to sign so that Annette could auction off the framed print with all the deploying soldiers names on it to the highest bidder. Annette did a great job organizing this event and I look forward to working with Annette in the future. Here is a new piece that includes the art I used in a soldiers prayer illustration. Prints of this will be available soon. The original measures 13"x25.5". Email me at "steve@bergerfinearts.com if you are interested in this print. Something a little different for a change. This painting was initially sketched for a calendar cover. It turned up as something a little different but I am satisfied with the look. It features a P51 Mustang zooming through clouds that mix an American flag in with them. This painting is about 40" wide by about 30" high so it is a pretty good size piece. I had fun painting and concepting this piece. I always wanted to fly one of these planes if I had the chance but I am not sure who would allow me near one of these planes much less in the driver seat of one. I have not let up on the state flag series I just have been sidetracked. Here is the newest addition. The Texas flag. If you read my last entry it was evident a new painting had to be painted that addressed the other " An Appeal to Heaven" flag. Here is the new revised "Appeal To Heaven" painting which does not include "An" in the artwork. I also wanted to depict this flag as it would have appeared on George Washington's ship "Hannah",one of the first ships to fly this flag. The Hannah was a schooner and this type of vessel has very distinct sail and rigging. I think I have it depicted accurately in this painting. On to the next flag painting of this series but I think I like this one the best. I just finished (well almost) another painting for the American flag series. This flag and its variations were flown before and during the American revolution. This 4'x4' painting finishes the collection that has the Preamble to the Constitution as part of the art that goes with each painting of the series. I may have to make some minor changes to the size and color of the type that says "to ourselves and our posterity" but at least people can get an idea of how this painting is shaping up. I also may have to take the "An" off and change it to read "Appeal to Heaven". My research indicates it has appeared both ways but "Appeal To Heaven" seems to be a more accurate version because it implies an ongoing imperative versus a singular event that "An Appeal To Heaven" seems to indicate. I will have to find out more before all the paint dries. Massachusetts, which came to be known as "The Liberty Tree". This tree became a visual symbol for the emerging American independence movement in Boston. These increasingly vocal patriots would gather under this tree knew their yearning to break away from England would only tighten England's grip on them. So the flag with the tree represented independence but because The Sons of Liberty also believed that they were sustained by a much higher power than England, it was very important to them to add the "Appeal To Heaven" motto on their flag. By the way the motto comes from John Locke's second treatise on Civil Government. The "Appeal To Heaven" flag was flown on George Washington's private squadron of six schooners which he outfitted at his own expense in the fall of 1775. The flag was hoisted first on Washington's ship Hannah on September 2nd 1775. These schooners were the first ships in the emerging continental navy and were commissioned by the Commander in Chief, George Washington. The Massachusetts General Court established that a flag for the state navy was needed and adopted the "Appeal To Heaven" flag on 26 of July 1776 to make it official. Their are multiple versions of this flag existing today but because the original was captured by the British and destroyed we really are not sure exactly what the first one looked like. I think I am pretty close though. As I work on President Washington's painting with his personal flag I thought I would post this watercolor of soldiers at Valley Forge also. The cannon and uniforms were fun to research for accuracy, (note the design on the pack of the one soldier). I intend to do another painting similar to this one but from a different angle and with a flag somewhere in the picture. I would also like to add horses and a fire in the picture with the painting showing the same place just later on in the evening. Makes me cold just thinking about it. This print is for sale just email me if you are interested in it. My newest state flag is done. This 2'x2' acrylic on canvas features the great state of Indiana's flag. Like many other state flags the original design of the Indiana State Flag is the result of a design competition sponsored by the Society of the Daughters of the American Revolution, at the behest of the General Assembly, during the state's 1916 Centennial celebration. Two hundred proposals were received and examined. The winning design by Mooresville, Indiana artist Paul Hadley was adopted by the Indiana General Assembly with an effective date of May 31, 1917. I feel this flag is branded well. Even though it takes a little explaining it all makes sense. Like most state flags they all tell a unique story. I am really amazed how active the Daughters of The American Revolution have been in the past to ensure that all states have thier flags. This flag as well as other state flags that I will be painting over the course of the year now have a home on the www.bergerfinearts.com website under state flags. Of course I will post as soon as I finish. I recently finished the color version of Custers Personal Battle flag made for him by his wife Libby. You can see my earlier post where I talk about the history of this flag and how it has been misrepresented. Because Custer had a problem with authority he would also go against military formalities like proper uniform dress codes. He is pictured with a red tunic and a naval light blue shirt. The flags colors are derived from the actual flag that was auctioned off to an investor by Custer's nephews 75 years after the Little Bighorn. A photo of this historical flag was shown before the auction to potential buyers. The original showed ragged ends and obvious wear. Well here is the newest painting of the 28th Virginia Infantry Division's flag captured at Gettysburg on July 3rd 1863. It is the other side panel of the flag that features the "28th" printed on it. The two paintings are meant to be seen together side by side. I may in the future paint the entire Virginia flag. There are some Minnesota 1st regiment flags that I would like to capture next. 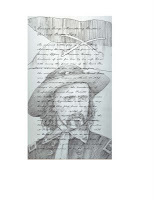 In doing my research for George Armstrong Custer personal battle flag I noticed it was recently auctioned off in Dallas Texas. This gave me an opportunity to see the actual colors, dimension, and design of the original flag. Every graphic representation that I could find of this flag (and there are a lot of them ) in books, flag supplier catalogs that offer replicas of the flag and reenactment activities held at the Little Bighorn where battlefield enthusiasts carrying the Custer Flag all are depicting an inaccurate representations of the original Custer Flag. The colors and design of the flag when compared to the original are all wrong. Its a shame that the people who do the reenactments who are trying to be as accurate as possible with uniforms and dress of the times are not aware of this inaccuracy. This flag's history is of course as colorful as it's bearer. His wife libby hand sewed it for him in the final days of the Civil War and was personally delivered to him on the battlefield in the midst of battle at Dinwiddle Court House near Petersburg, Virginia on March 31st 1865. It was with General Custer at Appomattox where he witnessed personally Lee's surrender of the army of Northern Virginia. This is one of the most important flags in American history and it should be shown accurately. It was passed on down through the Custer family, and was preserved by his relatives from the Custer farmhouse in Monroe Michigan. The flag was later purchased from his nephew Lt. Col. Charles Custer just 75 years after it last flew above General Custer himself. I will be painting this flag soon and will post it and offer it for sale as soon as I finish. Watch for it on follow up posts to this blog. I recently had the opportunity to view the Virginia Battle Flag captured by the 1st Minnesota Volunteers at the battle of Gettysburg for a painting I am doing of it. This historic flag is being very well kept under the care of Matt Anderson of the Minnesota Historical Society. Matt was very helpful on filling me in on the history of the flag, he definitely knows his stuff. When looking at the flag I discovered that the flag is in much better condition than I expected, some of the Minnesota regimental flags that were on display at the State Capital building were very faded and fragile looking and not nearly in the condition of the Virginia flag. Matt also informed me one of the reasons that the 28th Virginia Infantry flag in his care is in such good condition is that the Virginians received this particular flag two weeks before the battle of Gettysburg. So it was almost new when Pickett's charge was initiated at Gettysburg on July 3rd 1863. I also learned that the type that announces that this is the "28th. Inf'y. is only on one side of the flag. Being this close to a piece of American history is always exciting to me and it makes it even more meaningful when I paint my representation of it. The flag shows some small holes, tears and staining along with light fading of the color red all of which I hope to duplicate in my paintings as much as I can. Attached to this post is a first color proof of the final painting. Watch my website and I will post it as soon as I have it finished. Prints will most likely be in the 2'x2' size. I am also working on paintings of famous Americans who carried personal flags. It was only appropriate that I start with the first president, George Washington. Actually he had two personal flags that he carried with him throughout the Revolutionary war and these flags went everywhere with him. The pencil sketch shown here will be later turned into a painting. I just have to get my ideas for the painting down on paper one of which is to show a much younger Washington. This is the way I imagined him to be during the war years. I have not seen many depictions of a young George Washington in military gear so this will be my perspective. The flag featured in this sketch is what I believe was the first and his favorite personal flag. From what I can gather this is the one he had carried at Valley Forge when the Continental Army was at a particular low point so it was with him when things were the roughest. 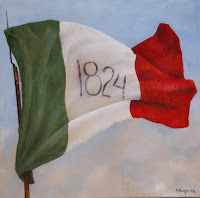 I am still researching other paintings that show the correct color of this flag and I think I am getting closer to finding an accurate color. What I did find makes me believe that the flag was a light blue with white stars. This light blue was prevalent in a lot of French flags of the time and its a good bet that it was popular with the American colonist also. A painting by William Mercer (Battle of Princeton) shows a large blue standard with this particular arrangement of stars. The alternate flag showed a circle of stars much like the Betsy Ross flag only without the stripes. There was an artist of the time named Peale that shows a blue that was much darker for this flag. Washington's "Life Guards" the predecessors to the modern day Secret Service used this particular standard with the circular star pattern as their identification mark. I am also finishing up a General Custer sketch that will feature his personal flag in much the same style as this painting. Watch for this one soon. A real interesting history to this one. I just finished painting the North Carolina flag. A very interesting history and a lot of variations happened to this flag over time. The first design submitted by Colonel John D. Whitford on the day of May 20 1861, on the date of the succession resolution and signed by North Carolina was never actually used. That is of course why I would like to paint it so look for this one to show unannounced sometime in the near future. Soon after the first design was submitted Colnel Whitford and his committee got enough feed back that they felt it was necessary that they consult an artist from Raleigh by the name of William Jarl Brown. Mr. Brown submitted his design which of course was totally different than the original design done by Colonel Whitford. This flag was approved by the North Carolina Convention on June 22, 1861. This flag was carried by the North Carolina Regiments, along with the Confederate colors, throughout the Civil War. After the war North Carolina flag was again changed but this was the last time. The dates on the current flag stand for two important dates in North Carolina History. The top scroll above the star has the date of the Mecklenburg Declaration of Independence but the date displayed on the lower scroll relates to the date of the "Halifax Resolves" April 12th 1776. This is my first attempt at blogging so I am not sure there is a right way or a wrong way. I wanted to have a place to show new art for people who have purchased art from me in the past and just wonder what I have been painting as of late. The United States flag project will occupy a lot of my time in 2009. I recently finished the South Carolina flag and the Minnesota flag, which the Minnesota flag was extremely complicated and could not get the file small enough to post on this site. I will continue to accurately portray through research original designs of each state flag. It is truly amazing how flags change their looks over the years. Its like someone keeps taking a Xerox copy of a Xerox copy over and over again until you finally get a blobby looking glob for art that gets sewn on a flag. I will write more about flags later. I hope to fill in with branding and Identity projects the rest of the year in 2009. With this economy its nice if you can just keep busy. If I get lucky maybe I will get some cartoons to draw this year also.